Newly constructed in 2014 and located down a private drive, the house features an open-concept living/dining room and a modern kitchen with new appliances as well as a game area in a 6-sided turret on the 700 sq foot first floor. A curved-oak stairway rises to the second floor’s three bedrooms, capable of sleeping 6, and a large bathroom with a small washer/dryer. 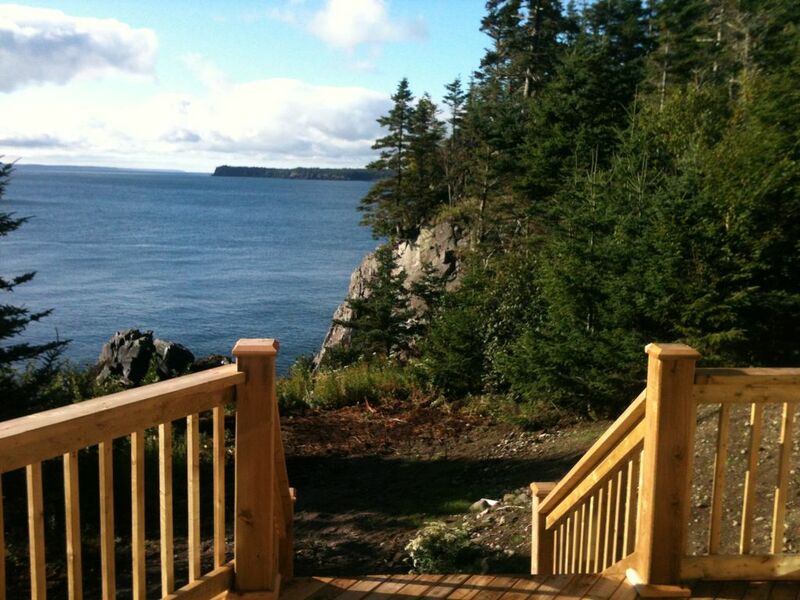 The master bedroom 6-sided turret area offers breath-taking views of Grand Manan , 6 miles away. Outside, covered porches extend the length of the southern (ocean) and northern (forest) sides of the house, plus an uncovered sun-deck off the ocean-side porch. Enjoy outstanding oceanfront views either from the house or from the rocky point with small, spruce-lined coves on either side. A 10 minute walk on a forest trail down the island’s eastern shore takes you to Herring Cove Park with its 2 km (1 mile) long beach and 9-hole golf course. Nearly 25 km (15 miles) of hiking trails are available in Herring Cove Park and adjoining Roosevelt/Campobello International Park – a total of over 1,500 hectares (nearly 4,000 acres) of preserved parkland. Enjoy wildlife (eagles, seals, occasional whales and dolphins), island activities (hiking, golfing, kayaking, cycling, Roosevelt Cottage, whale watching), restaurants on the island or in Lubec, Maine, or just relax watching the 22-foot Fundy tides rise and fall..
Due to steep rocky cliffs,leading to our pebble beach, our home may not be suitable for renters with young children . Campobello Island's scenery is only surpassed by it's wonderful residents in two rural communities: Wilson's Beach and Welshpool. The island has a Village Store that includes a well- stocked grocery, drug store, ATM and Community room with wi-fi. Part of the nearly 2 mile long Herring Cove beach shoreline can be seen from our rocky point. A half-mile forest trail connects the property to the beautiful Herring Cove Beach. Property has a small gravel beach at the head of one cove, accessed from a rocky point - great for launching kayaks or small boat or ocean swimming (best in a wet-suit). Wonderful 9-hole Herring Cove Golf Course is open to the public just 1 mile away. Outstanding ocean views from our ocean frontage or from the house. Viewable shorelines include Herring Cove Provincial Park and the adjacent Roosevelt/Campobello Park, Eastern Head and Grand Manan. Property has about 200 feet of crashing-surf ocean frontage around it rocky point and two small coves on either side of the point. Land-line phone available. Cell phone coverage is available - usually a good signal, may be better from second floor bedrooms. U.S. guests should adjust their Plans to allow calls to/from Canada. Electric baseboard heat heats whole house. Bedrooms have their own thermostats. Small capacity washer/dryer is available. Towel sets provided for the members of the Guest's party. New kitchen with stove/oven, microwave, refrigerator, dishwasher. Dining room table has room for 6 plus ocean views from the table. A small selection of novels is provided. Several board games and puzzles are provided. A few DVD movies are provided. Feel free to bring other movies with you. Young lawn - still growing-in. No kayak provided, but they can be rented on the island. Covered porch that wraps around the ocean-side (south), west-side and north-side. Great sitting area on rocky point. Sunny deck on the ocean side, plus covered porch that wraps around the ocean-side (south), west-side and north-side. Great sitting area on rocky point. A tennis court is accessible through our property-owners association. Great 9-hole Herring Cove Golf course - 15 minute walk or 5 minute drive away. The property was lovely. Clean and bright and trouble free. Woken up several times in the very early morning by whales blowing as they swam by! The location is beautiful and convenient to the park and to what nature has to offer. My husband and I would definitely rent here again! Our second stay in this lovely home was ever thing we hoped. The home is the perfect place to watch all the wild life and sea life available around the island. It is located conveniently near the Roosevelt International Park and the bridge to Lubec, ME. We hope to make Campobello and this home an annual destination. Amazing Vacation! Technology OFF... Nature ON! My family (my husband, my teenage daughter and son and my mom) spent a lovely week at this beautiful home on the Bay of Fundy. We were entertained daily by many forms of aquatic life and, of course, the eagles soaring over the house! On the island we visited the wharfs, the lighthouse and Roosevelt’s summer home, all of which we enjoyed immensely. The private beach through the woods was fun! Surprisingly not made up of sand but soft rounded rocks. It was fun to comb the beach each day looking to see what the ocean gifted us! It was great watching my kids play Monopoly instead of looking at their phones. I think I saw more of them this week than I have all year, ha! We were sad to leave at the end of the week and would definitely return to this secluded paradise! We loved our week in this beautiful and comfortable house. It is so well designed that even on the few days that were foggy the house was bright and delightful. We have been coming to the Lubec/Campobello area for 20 years and this is the nicest house we have ever rented. The walk through the woods to Herring Cove Beach is magical. This property is one of the nicest on the island. The atmosphere was peaceful, yet invigorating. Would definately return. Only down side was lack of Internet access. We own businesses; and although we were looking to get away, we still needed to make some contact via Internet. Localized Internet would make it possible for us to stay longer. Our week in the home on ocean side of Campobello Is. was just perfect. The house is everything promised by the owners. Peaceful, isolated and yet near the Roosevelt Park, clean, well-equipped kitchen, first rate linens, and a view to take your breath away. We had beautiful, warm, sunny weather for all but the last two days. We could hear the tide come in and out from the bedroom windows upstairs at night, and see the moon and stars. We had hours of viewing time on the wide porches around the entire house. We watched six bald eagles for over an hour, at dusk fishing for their dinner. One young eagle perched on the rocks in front of the house to devour its catch, while another young eagle sat nearby hoping for a bite. There are plenty of areas to walk nearby, and loads of hiking and carriage trails on the island. There is a grocery store on the island that carries almost everything you might need and the IGA in Lubec, ME is only about 15 minutes away. The border crossing on the bridge was almost no wait at this time of year.The owners were responsive to our requests. Although they do not have internet as of yet, and the cell phone service is spotty, they do have a land line, so a calling card worked well for us. The Community Center allows use of their internet during open hours, which worked fine for us to check e-mails every few days. I did have a few bars on my cell phone on the front porch and over most of the island. We really do plan to come back and use this home as a base to see more of New Brunswick next year. Rates are subject to change until reservation is confirmed. Smoking and pets are not allowed anywhere on the property. With outstanding ocean front and crashing surf, the property has steep, dangerous 30 foot cliffs on part of the shore front, and the property may not be suitable for renters with young children. Property is in Canada so all U.S members of the renting party will need a valid Passport.